Health is important in human life, but unfortunately the price of drugs on the market becomes more unreachable when you get sick. Not to mention the process of looking for a drug that is sometimes difficult because it may not be available in the pharmacy stores. Pasar Obat Pramuka or Pramuka Drug Market is located on Jl. Raya Pramuka, Jakarta Timur/East Jakarta is one answer to the above problems From the outside, this place is like a regular market. A lot of people in and out, but it did not cover a drug store boards listed in each stall and the most important is the Pramuka Drug Market is very clean and well maintained, very different from the appearance of the traditional markets in general. Pramuka Drug Market has 400 stalls selling drugs and medical equipments. Pramuka Drug Market also has 26 People Pharmacies established by a decree of the Minister of Health No. 284/2007. This decree issued by Siti Fadilah Supari that served as the Minister of Health at that time. The establishment of the People’s Pharmacy is intended to expand access to cheap medicine and guaranteed to the people. In addition, the People’s Pharmacy is also intended to curb circulation of fake drugs and illegal, as well as provide opportunities for pharmacists to provide pharmacy services. 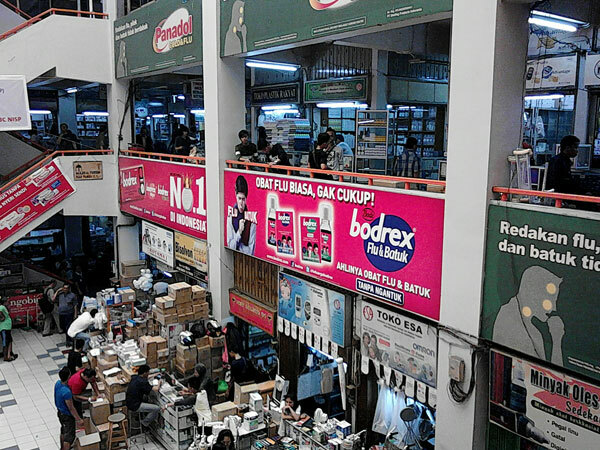 Entering the market, there are two floors that serve as the drug market; on the ground floor and 1st floor. There is no specification of drugs or medical equipment sold in each floor. Everything is mixed, ranging from drug store to medical equipment store. The price of each product sold varied, but cheaper than in a regular pharmacy or hospital. Generally, the price of drugs sold in the Pramuka Drug Market 20-30% cheaper than those sold in the big stores. Each store had a signpost certificate contains the name and certification number from the Ministry of Health. This is intended to prove the drugs are sold suitable for consumption. Each stall also has a pharmacist on duty checked the doctor prescribed. Therefore, there is no drug given in large quantities to consumers. On each floor, you can find store that sell generic drugs to the various medical equipment such as cosmetic box and doctor clothes. You can also find medical equipment and health ranging from wheelchairs, oxygen tubes up. In addition, there is also a traditional herbs store.